[C4DtoA] How can I make my background object visible in refractions? You can’t. The background object isn’t visible in refractions. Or reflections, or anything but camera rays. Here’s an example: a refractive sphere in front of a torus, in front of the background checkerboard object. The black areas are where the background object isn’t visible to refraction rays. 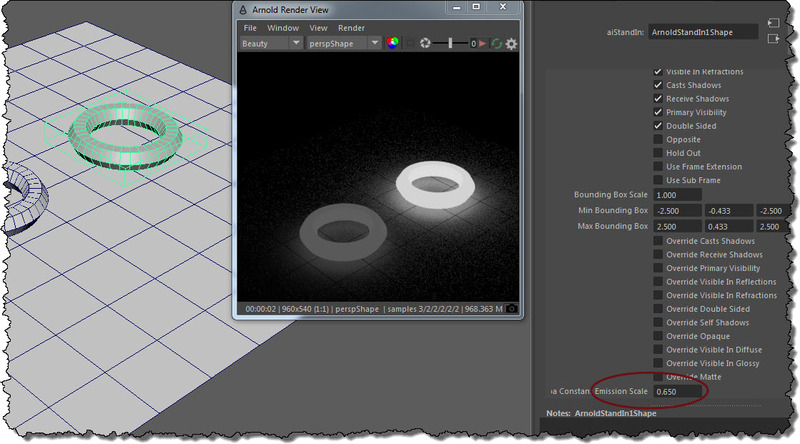 The “background object” is actually a shader plugged into the Arnold background slot. You won’t see it in Cinema 4D, but when C4DtoA translates the scene to Arnold, the background object is translated as a shader plugged into the options.background parameter (in Cinema 4D, this is the Environment > Background parameter in the Render Settings). The image_plane node is a shader, and if you were to check its code, you’d see that it handles camera rays only; for any other ray type (like refraction), the image_plane shader returns black. As of Arnold 4.2.16.2, the requirement is now “just” SSE4.1. This blog post is for Google search to find; I’ve already blogged about the SSE4.1 requirement elsewhere. If your processor does not support SSE4.1, the Arnold won’t run on your computer. MtoA will either fail to load, or you’ll get a crash whenever you try to render. cpu-world is pretty reliable, but I have seen one or two cases where the info was wrong, and SSE4.1 wasn’t really supported by a processor. If you see an asterisk (*), then SSE4.1 is supported. If you see a dash (-), then SSE4.1 is not supported. PyMEL is great. But…if pymel.log can’t be accessed, any plugin that uses PyMEL will fail to load. That error means that PyMELcannot create a log file in your user folder. You need to check the permissions on that log file, or delete it so that PyMel can create a new log file. Note that the pymel.log file may be a hidden file. Here’s a good example of why you might use the User Options, and how it lets you set Arnold parameters that aren’t exposed by MtoA in Maya. But what if you’ve got thousands of image files (eg udims)? You might not want all that in your log. There used to be a check box in the Arnold Render Settings that allowed you to turn off the detailed image file statistics, but we removed that a few years ago.